Slovenia, a country with a population of 2 million at the border of Italy, Austria, Hungary and Croatia, is one of the ten new countries that joined the European Union in 2004 and Euro is to be introduced on 1st January 2007. Long term orientation towards quality medical care traditionally has existed in Slovenia. The new integration sparkled processes that expanded future goals and created possibilities to actively participate in European projects. Slovenia was the northern republic of the former Yugoslavia, which became an independent state in 1991. With Austro-Hungarian tradition and its new motivation, the nation quickly and effectively created the instruments needed for statehood, and choose parliamentary democracy as its political model. Ever since independent, its gross national product rose from just over 5.000 to over 19.000 USD per capita and in 2005 was more than 70% of the European Union average. The population of Slovenia is comprised of more than 90% Slovenes, a distinct Slavonic nationality with its own language that survived all melting pots of the past. Religion in Slovenia is predominantly Roman Catholic. A centre-right government was elected in 2004 after 12 years of centre-left liberal democrat rule. Geographically, the country is a blend of Mediterranean south, Alpine north, and wine producing West and East. More than 50% of Slovenia is forest, making it one of the greenest parts of Europe. Ljubljana, a capital of 300.000 people is a town around a river that calmly flows beneath the Medieval castle and brings together all young people by heart, among them more than 50.000 students. Ophthalmology in Slovenia has a tradition of independent specialisation for over 100 years. It has been linked to Austrian, German and French ophthalmology, whilst in recent years it is oriented primarily towards the British and American schools. Ophthalmologists are organized in the Slovenian Society of Ophthalmology, which is part of the Slovenian Medical Association. Traditionally, about 100 ophthalmologists serve the population of 2 million, which puts Slovenia the fourth from the bottom of the EU countries after The Netherlands, United Kingdom and Ireland. Hospital treatment has been constantly reduced in favour of outpatient procedures resulting in high daily turnover of the patients. Due to the relatively low number of ophthalmologists, waiting list is around 3-6 months for non-urgent examination. However, every patient having acute problems is seen immediately at a triage clinic. The norm of the state insurance company is 4.65 patients per hour. In hospitals, the DRG system was introduced in 2004, which devalued ophthalmology in relation to other specialties. Average reimbursement for a cataract operation with everything included is between 600-700 euro, and the price for private surgery is around 900 euro. Salaries range from 1100 euro for a resident to 3000 € for a professor, which is low in comparison to managing directors, lawyers, government administrators, etc. This creates impression that medical profession is not properly valued. The New University Eye Clinic, in which over 10 million euro was invested by the Ministry of Health, has all equipment necessary to keep up with European standards. It has been built in 2000 by thorough renovation of an old army surgical hospital. The Old Eye Clinic that was over 110 years old was demolished in 2001. New clinic has nearly 11.000 square meters and serves as the only tertiary eye canter in the country. The hospital has 60 beds including 10 pediatric ones where mothers can stay along with their babies. Diagnostic procedures include fluorescein and indocyanine green angiography, autofluorescence imaging, up-to date ultrasonography, electrophysiology, computerised colour vision testing, microperimetry and regular automated perimetry. 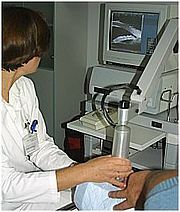 Scanning laser ophthalmoscopes, nerve fiber analyser, specular and confocal microscopes, colour Doppler and a flowmeter are used mainly for research. Diagnostic procedures such as CT, MRI scans are available at the main building of Ljubljana University Medical Center. Erbium-YAG lasers for oculoplastic surgery have been developed at Slovenian companies Optotek and Fotona which also used to manufacture Rodenstock Scanning Laser Ophthalmoscopes. Every year around 130 medical students come for training and examination. The curriculum is composed of 45 hours of lectures and 30 hours of practical exercises. Chair of ophthalmology has its website to help students with materials. There are three Professors, one Associate Professor and five Assistant Professors responsible for organization of teaching at the clinic. Regular lectures and case presentations by residents are taking place 2-3 times a week, and journal review once a week. We also receive many guests from neighbouring countries which come for training. 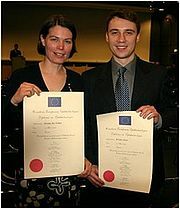 We can proudly say that our teaching system is successful as one of Martina Jarc-Vidmar and Krešimir Macan qualifiying for FEBO title in 2005 our residents, Dr. Martina Jarc-Vidmar, was ranked first overall on the EBO Diploma Examination in Paris in May 2005, and the second candidate from a regional hospital, Dr. Kresimir Macan also passed the examination without difficulty. EBO certification of the hospital was received in October, 2005. Research is a strong element of the clinic with 26 researchers participating to the projects running by support of Slovenian Ministry of Science. These projects enabled 5 resident-researchers and one full time biologist to be paid by the Ministry. All five completed the M.Sc. degree and three of them accomplished their Ph.D. this year. Alltogether 10 medical doctors have done their PhD and two more are expected by the end of 2007. With the New Clinic, a research centre was created with a wet-lab and 4 laboratories for clinically motivated basic research and the Eye Bank. We have published papers at home and abroad in indexed journals on almost every method that was introduced in the clinic. We have actively pursued the development of the SLO imaging, in particular autofluorescence imaging in combination with electrophysiology. Clinical electrophysiology has a long tradition in our institution and our own ERG electrode (HK-loop) was developed in 1991, later to be standardised by ISCEV and used internationally. Pediatric electrophysiology, preformed by dr.Jelka Brecelj, is up-to-date and developed with international collaboration with Great Ormond Street Hospital. Clinical background to these, as also many other studies in children, is provided by Prof.dr.Branka Stirn-Kranjc. Clinical research was also instituted in the field of lasers for ocular and periocular tissues under the leadership of Prof.dr.Brigita Drnovsek-Olup in collaboration with slovenian companies Fotona and later Optotek. The new lasers are being developed and tested, such as Er-YAG laser for periocular tissues and probing of canalicular obstructions. Histological comparisons of different ablative modes are being currently studied. Research in glaucoma and ocular surface has been performed by Assoc.prof.Barbara Cvenkel. Studies included measurements of nerve fibre layer using HRT, RTA and GDx and follow up of patients treated by SLT- Also, flow cytometry was developed to evaluated to test different ocular surface conditions. Clinical genetic studies have been performed for retinal dystrophies and diabetic retinopathy in association with professors Damjan Glava? and Borut Peterlin. We have contributed to the first study that published results of gene chip in Stargardt's disease, led by the group of Rando Allikmets. 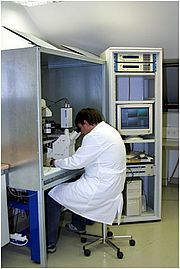 Our basic laboratories are equipped with methodology for calcium imaging, patch clamp, electrochemical measurements and different histological techniques. We aim to study lens epithelial cells and limbal stem cells in the first phase, later developing RPE cultures and studies on retinal neurons. We have successfully applied and published the technique of direct electrochemical measurements of dopamine and ascorbate in extracellular fluids. The old coastal town Piran is within walking distance from the modern conference center. Slovenian ophthalmologists always attended international meetings. We have also been active in organisation of meetings. In 2003, we have organised Moorfields Macular Course with 11 speakers and about 160 attendees at Portorož. The successful first course resulted in an equally well attended Moorfields Uveitis Course in 2004. In 2005, an international refractive surgery meeting was organised with help of professor Marie-José Tassignon from Belgium. In June 2005, we hosted the Child Vision Research Society symposium, and in 2007, Ljubljana will host European Society for Ocular Plastic and Reconstructive Surgery, and in October, the European Pediatric Ophthalmology Society symposium will be held in Portorož. We are especially proud that we become the hosting country of the EVER Meeting from 2007-2009 in Portorož, our coastal resort. We estimate that ophthalmology in Slovenia is already performed on European level and has a continuously upgrading trend. We are looking forward to further integration and more intense communication with developed centres in EU and contribute locally to EVI standard of research services. This should also contribute to equal standards offered to our patients compared to developed European centres, which is our most important goal.